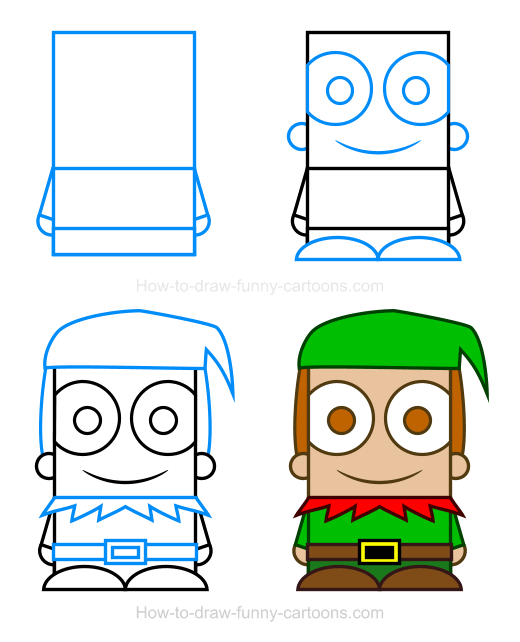 In this adorable tutorial, I will show you how to draw a fun elf clipart made from simple elements and filled with plain colors. Elves are interesting characters to illustrate. Dressed with colorful clothing and often the size of a small child, these imaginary creatures have many feature that are amusing to depict. 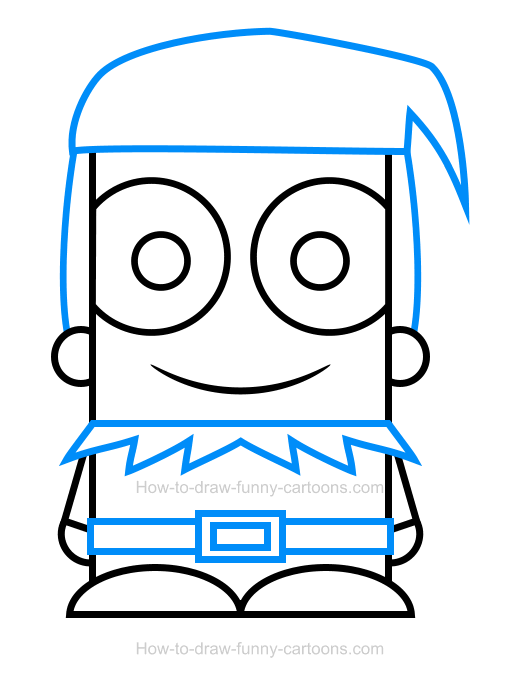 You can start by adding a large square to create the head of the cartoon elf. 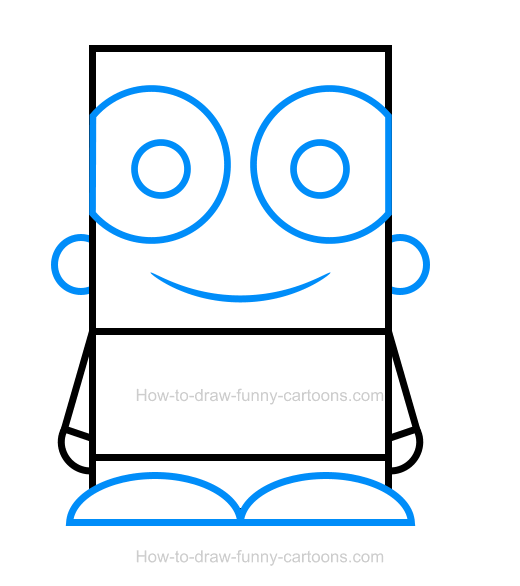 Then, a small rectangle is drawn to represent the body of the character. 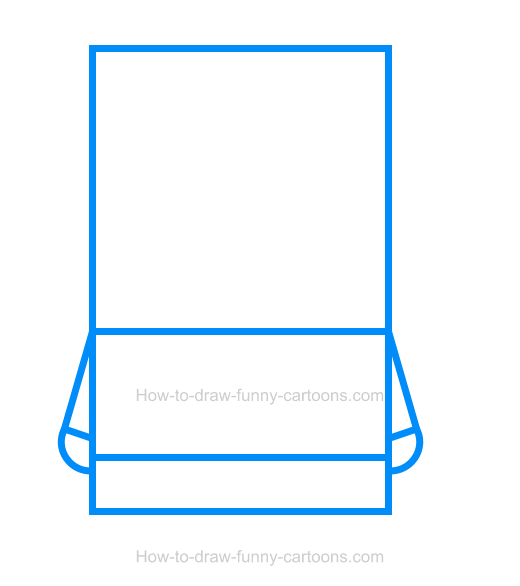 Finally, a second (and smaller) rectangle is sketched to form the legs. The arms and the hands are done using small rectangles and circles. Excellent! You can now proceed with the second step. On both sides of the head, you can draw small circles to form the ears. Inside the head, draw two large circular shapes to illustrate the eyes. The pupils are also made from circles, but smaller ones. The mouth is done using a long curved line. Complete this step by sketching two long curved lines to create the feet of this adorable elf. On top of the head, draw a large hat using a mix of curved lines. You can also add hair on both sides of the head. Then, you can draw a large rectangle (and a smaller one) to illustrate the belt located above the pants of the character. Complete this step by sketching a few triangles on top of the shirt as shown in the illustration below. Great work! Why not add colors to make this fun character even more enjoyable to look at? The shirt, the hat and the pants of the elf are filled with a bright green color. The pattern on top of the shirt is red while the hair, the shoes, the belt and the pupils are brown. A little bit of yellow can also be added on the center of the belt and the pants are slightly darker than the shirt. 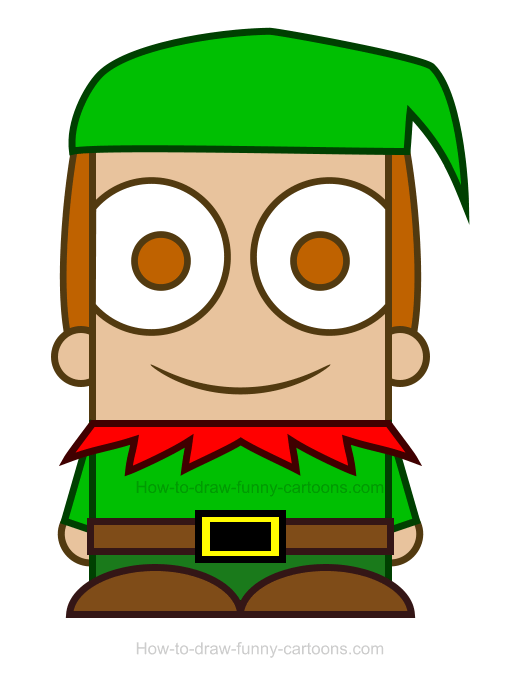 Congratulations building a solid elf clipart using simple basic shapes!